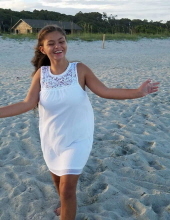 HURDLE MILLS: Michelle Grady, 13, passed away on Wednesday, April 10, 2019 at Duke University Hospital in Durham. She was born in Orange County, NC to Charles Herbert Grady, Sr. and Linda Grady (Greg Shepard). In addition to her parents, Michelle is survived by her paternal grandmother, Nancy Grady; maternal grandmother, Geraldine Immediato; sisters, Rose Grady, Bobbi Grady, Jessica Grady, Sara Forshee (Arturo Rios); and brothers, Christopher Estrada (Monica Hicks), Justin Grady (Rebecca Grady), Charles Grady Jr. (Jessica Lane). She is also survived by her beloved puppies, Jax, Mickey, and Roxy. Michelle was predeceased by her paternal grandfather, Stewart Grady; and maternal grandfather, Santos Estrada; and great-grandparents, John and Geneva Persinger. Michelle had many passions and interests. She loved all kinds of music including rock and roll and Christmas music, which she loved year round. Christmas was her favorite holiday. Michelle loved Mickey Mouse and Frosty the Snowman. She also loved to watch videos in different languages on her tablet. Michelle enjoyed the beach, playing with babies and little boys, swinging and sliding. She enjoyed cooking and she often ate while she cooked. Some of her favorite things to cook were muffins and cake. Michelle touched everyone that she met and everyone fell in love with her. She didn’t let her special needs stop her from enjoying life. She will be missed by all that knew her. She loved to laugh and loved life. A memorial service will be held at 11 a.m. on Saturday, April 27th at the Clements Funeral Chapel in Hillsborough. The family would like to honor Michelle by requesting family and friends to wear her favorites, Christmas or Disney attire. In lieu of flowers, the family request that memorial donations be made to Exceptional Children’s Outdoor Learning Lab at gofundme.com/aspecialplayground. To send flowers or a remembrance gift to the family of Michelle Lynn Grady, please visit our Tribute Store. "Email Address" would like to share the life celebration of Michelle Lynn Grady. Click on the "link" to go to share a favorite memory or leave a condolence message for the family.